Members of Denton’s Nighthawk Composite Squadron of the Civil Air Patrol deployed to Oklahoma to help assess tornado damage. Team members deployed May 23 to the Army Reserve Center in Norman, Okla., where they were assigned to take photos of every house in one hard-hit area. The photos will be used by Oklahoma State Emergency Management and the Federal Emergency Management Agency to catalog the full extent of the storm damage. The squadron is typically used in air search-and-rescue operations, but team members walked every street in their assigned zone while in Oklahoma, according to a press release. Capt. Jared Cryer, team leader, stated that the squad took about 650 photos a day. 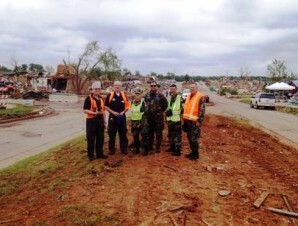 More than 100 members of the Civil Air Patrol from Texas, Arkansas and Kansas have been assisting the Oklahoma Wing. After a four-day deployment, team members returned to Denton on Sunday night. The Nighthawk Composite Squadron is located at Denton Enterprise Airport and has more than 100 volunteers who provide air search-and-rescue services and disaster response to local, state and federal agencies. For more information about the Civil Air Patrol, visit www.goCivilAirPatrol.com and www.dentoncap.org .